Babe naitonal park is located in Bac Kan province. The distance from Hanoi to Babe natioal park is about 240km, it takes 6 hours to get there by bus. Halong Bay is a landscape in HaLong city, Quang Ninh province which means “Desending Dragon”, has an area around 1553 km2, contains around 1696 islands. Ha Long bay the first time becomes a World Heritage is in 1994.It is amazing place you should never miss when you come to Vietnam. The distance from Babe to Halong bay is about 330 km , it spends 7 hours getting there. - Pick up point: Homestay/ hotel in Ba Be. 9.00: Our guide and car picks you up at the hotel or homestay in Babe Lake to the bus. 9.30: Get on bus to Que Vo district. 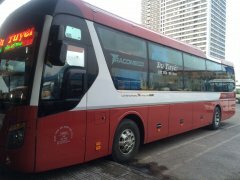 16.00: At Que Vo district bus station , get on bus to Halong city. 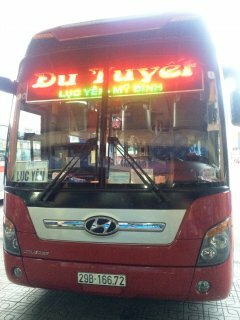 18.00: Arrive in Halong city in Bai Chay bus station (last stop). 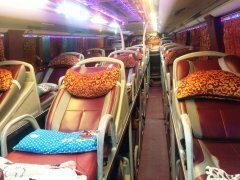 Included: English speaking guide, bus ticket to Que Vo, bus tickets to Halong city. Homestay in Babe lake – Nam Cuong – Don market – Que Vo district – Halong city – Bai Chay bus station (last stop). 15.00: Our guide and car pick you up at the hotel in Halong city to the bus station and get on bus to Babe lake. 23.00: Arrived Babe lake at Nam Cuong village. Included: Bus tickets to Que Vo bus station. Hotel in Halong city – Que Vo district – Nam Cuong village – Pac Ngoi village.